Four rounds of competition. The strongest teams will be fourth round semi-final seeded and paneled to determine a final round pairing. Remaining teams will be paired at random during the fourth round for additional debate experience. No entry limits. Novice is defined as any debater with ten rounds or fewer in any debate. 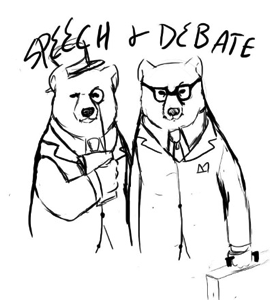 For example, a debater with eight rounds of previous public forum experience may enter as a novice in any of the three debates; however, if their CX or PF partner has 24 rounds of experience, the team must enter in the varsity division. Awards for 4th-1st will be given after semi-final (4th) and final rounds. Awards for top six speakers in each debate will be given after round 4. LD and PF will be flighted. New coaches can sign up for a boxed lunch seminar from 12:30-1:00: Policy Debate for Beginners. Enter online at www.lcdebate.tabroom.com if you have a Tabroom.com account, or email your entries to schripsema_s@aps.edu by November 9, 2011. Teams can expect community volunteer judges and are encouraged to bring at least one judge to contribute to the judge pool. Judges can sign up at http://www.signupgenius.com/go/20f0b4daea62ea0fe3-lcdebate instead of the Tabroom page, which requires a Tabroom account for judge sign-up. LCHS varsity debaters with more than 250 NSDA points in debate may be called upon to judge rounds 1 and 2 of novice division debates. Entry fees: $8 for LD, $16 for PF and CX teams; no mavericks. $5 for coach lunchtime seminar. Drop fees: $25 per entry, assessed after 5:00 pm on November 11. Deadline for new entries: Wednesday, November 9, 2016. Changes to previous entry: through Friday, November 11, 5:00 pm. The LCHS debate team will offer snack concessions, and there are numerous restaurants and a Smith’s grocery within a mile of LCHS. Judges and coaches will enjoy a hospitality room with coffee, tea, soda and water and various snacks. Adults not participating in the lunch and learn seminar should plan to eat lunch with their teams.